Archaeologists have uncovered evidence of a Roman Del Boy who made a nice little earner selling bogus coins to foreign invaders. Metal detecting enthusiasts examining farmland in Northumberland, found a hoard of 70 Roman coins dating back to the time before Hadrian built his wall. Experts from Newcastle University, who examined the coins, discovered native Northumbrians had been melting them down to turn into trinkets. The trinkets - such as brooches - would then have been sold back to the occupying Roman soldiers for them to take home as a memento of ancient Britannia. Roman expert Lindsay Allason-Jones, director of Archaeological Museums, said the find confirmed for the first time that Northumbrians were recycling Roman coins. She said the discovery of a sprue - the metal which solidifies in the air holes of a mould - led them to draw the conclusion. Ms Allason-Jones said: "This suggests for the first time that the native Northumbrians were recycling Roman coins to make artifacts, either for their own use or to sell to the Roman Army. "The coins were so worn they weren't useable as coins anymore and somebody locally has been melting them down and making them into trinkets, probably to sell back to the Romans." 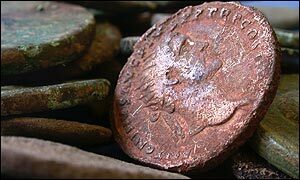 The coins were found by members of the Ashington and Bedlington Metal Detectors Group, on a farm near Longhorsley, Northumberland. The hoard of 70 Roman coins - 61 sesterii and 9 dupondii - dates from the reign of the Emperor Vespasian to the reign of Marcus Aurelius (69-180 AD) - a period when the Antonine Wall, between Glasgow and Edinburgh, and not Hadrian's Wall, marked the frontier of the Roman Empire. For a short period Northumberland, which had until then been barbarian territory, became part of the Roman Empire. Ms Allason-Jones added: "The hoard is very valuable in archaeological terms, because this glimpse of local recycling is evidence that there was a relationship between the native and the military population. "Although artefacts made from recycled metal have been found, this is also the first real evidence of native settlers using Roman materials as a source of recycling."